In FORUM Gustav Weiß looks at the The Great Big Wonder World of Art. Birgit Brühl reports on Firing Up in Bergen / Norway. Ting-Ju Shao presents Eva Hild from Sweden and Shigekazu Nagae from Japan. Q.:Herr Kurka, in the exhibition at the Keramikmuseum Westerwald, CERAMICS OF EUROPE, I first noticed your outstanding work. Through the purchase of both pieces for the Hetjens Museum in Düsseldorf, you now have two museums on your side… Are you familiar with this kind of enthusiasm for your work? A.: I think a lot of people are surprised by the lifelike appearance of the terracotta figures, they have a sense of standing face to face with another person. Some of them tell me that they have never seen anything like it. Q.: What does this do to you as a maker – how do you feel about this kind of approval? A.: I am very happy if my works can move people, when a kind of intimate dialogue develops between the observer and the figure. This cannot be taken for granted because my work is created on the basis of very personal decisions and everybody feels differently. I am often surprised by the wide range of reactions to my work. In spite of a very concrete style of representation, they still permit a great deal of room for interpretation. 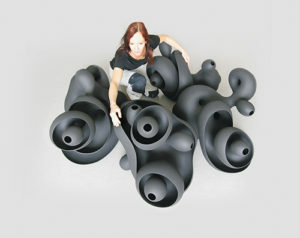 Maryland-based ceramic artist Ani Kasten’s education has taken her across the world. The artist’s introduction to clay came through an apprenticeship in a 13th century barn under Rupert Spira in Shropshire England. While Kasten creates highly idiosyncratic pieces, both her and Spira’s work share the same echoes. In the austere forms and intense texturing, both artists reflect back to classical vessel oriented ceramics of artists like Lucie Rie and Hans Coper. 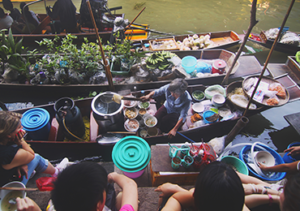 After her year-long residency, Kasten headed to Nepal. There, she began a four year project, this time with Nepalese potter Santa Kumar Prajapati. The artist had received a grant from the Ramsay Merriam Fund for the purpose of introducing high fire stoneware technology into the village of Thimi. Thimi is a small village located about 11 kilometres from Kathmandu. In writing about this experience – the artist describes the village as being preserved in time – Kasten states, „Wandering through the streets of Purano Thimi (Old Thimi), one is struck by the extent to which the village has been preserved as a pottery-producing centre since ancient times.“ While there, Kasten developed stoneware clay and glaze recipes, built high-fire kilns, designed a full line of high fire tableware for export, established a training facility and helped set up a website to promote the indigenous ceramics of Nepal. In 2006, Kasten returned to the States to accept a two-year artist-in-residence position at Red Dirt Studio in Mount Rainier, Maryland. Kasten cites the experience of working with sculptor Margaret Boozer as expanding not only how she uses the materials to make objects, but how she thought about objects. Summarizing the experience, Kasten states, „Working with sculptors at Red Dirt Studio increased my interest in how various sculptural materials converse and interact with clay.“ Afterward, Kasten set out on her own and established a studio about half a mile away on the north side of Rhode Island Avenue. A white studio, patina on the walls, a sense of morbid lightness. 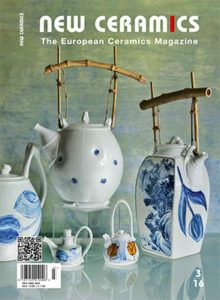 Here, Simone Krug breathes a new state of being into porcelain bodies and clays. Stories float through the room and are her permanent companion – the soul of what she does, which seems to have no timescale, no beginning and no end. Shadows on the walls from passing cars and things that stand against the light almost randomly are full of inspiration and are often what initiates the process of story-dreaming. No answer seems to be forthcoming to the question as to what come first: a product idea, a form, a thought, a word, an illustration simply thrown onto paper as a sketch. There is a time for everything, for its beginning and its becoming. A work like these never develops from the outside. They develop from the inside – growing outwards, becoming visible in time, becoming physical and eternal. This process of becoming is like the life of a cherry blossom. From an inner force, on cool spring days something unique emerges, which at that moment seems to be there only for itself, to seek attention. 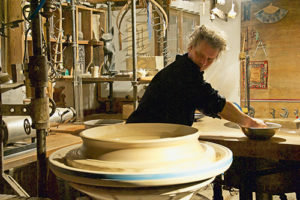 Some say that it takes 10 years to become a potter, that’s the time to learn about the process, gain knowledge and the skills to make work that can be recognized as one’s own. My apprenticeship has taken somewhat longer and the way I work and fire my pots is also a slow, time-consuming process and my graduation still seems a long way off. Circumstance, lack of space to work and many life detours have meant that 10 years became 30. Making pots with coils or ropes of clay was convenient; it required little space and almost no equipment. Wrapping half finished work in discarded, plastic shopping bags has become a way of life. 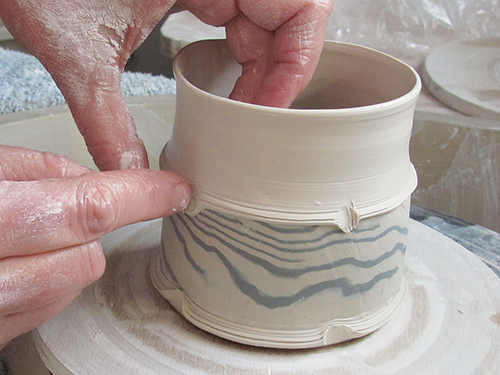 I never got to grips with making pots on the wheel and now I’m happy working in this traditional way. 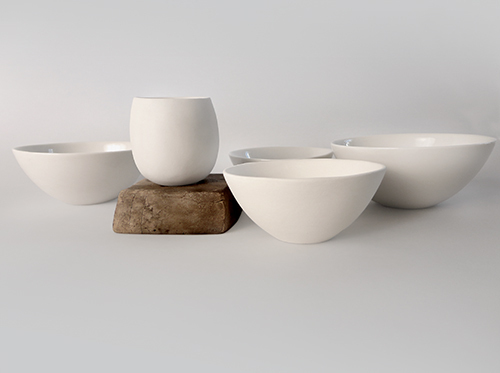 Coiling is an ancient pottery tradition, dating back 15,000 years to the Jomon culture in prehistoric Japan. Like the Jomon, potters use ropes of clay to create a variety of sculptural and functional forms. I like the rhythmic way of working, rolling the clay with the flat part of my fingers, pressing and blending the coils together, drawing the clay walls upwards, caressing and coaxing the pot ever upwards. I refine the profile as I build, push from the inside, paddle with a flat piece of wood on the outside to persuade it inwards. I start each pot with nothing more than a pinched disc of clay and a vague intention of the final product, each pot the product of all those made before. It will have its own identity, its own character, occupy its own space. It will inform the next one. In how many schools around Germany are fully functional kilns lying dormant in some neglected corner, kilns that had been purchased in the turbulent 1970s to introduce the younger generation to earth as an artistic medium? 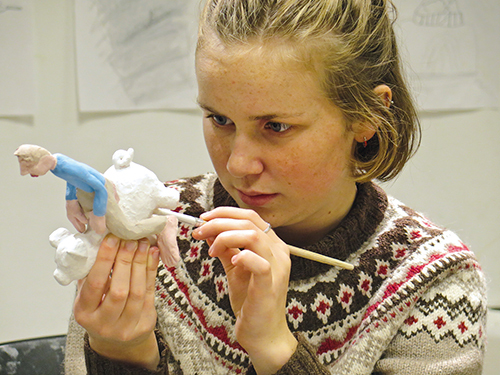 At the same time, the students were supposed to be familiarized with the boundless possibilities of creative freedom. 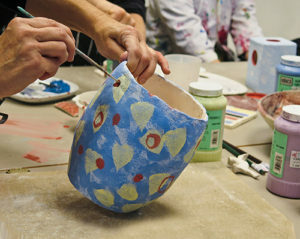 Today, there are no teachers left who know what these kilns are for, much less how to integrate them in their lessons. In any case, today’s curricula leave no room for that kind of thing. This is not only the case here in Germany, but also on the other side of the Channel. It was practising ceramists became aware of these kilns and the missed opportunities they offered to provide haptic experience in a totally automated world and thus to revive the creativity in every one of us. Between 2010 and 2013, under the aegis of the Crafts Council, a programme was developed in the UK that brought together 63 secondary schools with a total of 3,700 students and 161 teachers to raise awareness of the importance of clay in our everyday lives and in cultures around the world, to support schools using this medium in art and to optimise its educational value as well as demonstrate the close links between working with clay and the whole area of the creative industries. There have now been a large number of successful exhibitions with the work of the students in the schools participating, one might even say there had been an exhibition „Olympiad“. The programme, which receives government funding, is to be continued. The Tea Festival in Mungyeong, South Korea, opened doors, and people who had met there wanted to see each other again. Ceramist encounter each other enthusiastically and openly without being able to understand the other’s language. The world today can only dream of this, a magical encounter with the unknown. 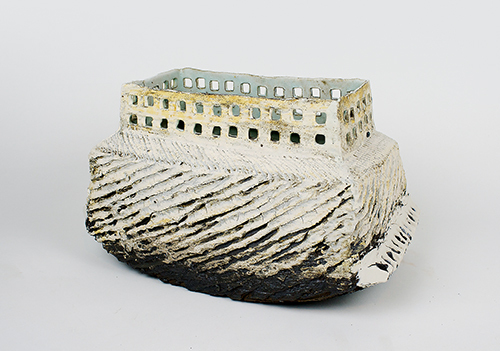 On the edge of the small town of Giessen near Frankfurt, four ceramic artists met up again. At the beginning of the year, Berthold Zavacki, the host, had received an e-mail from Robert Lawarre III, who told him he would be in Germany in the middle of the year. After his stay in Höhr-Grenzhausen, Robert promised to come to Giessen. 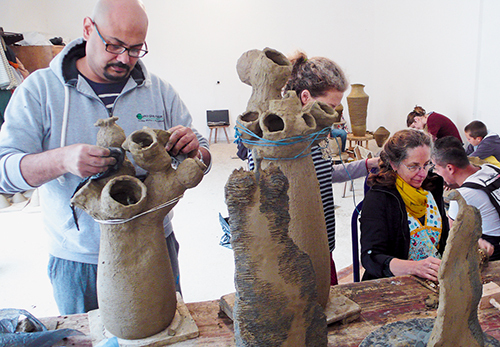 Apart from Robert Lawarre III and Rebecca Maeder, ceramic artists Jeon Changhyun, Sangwoo Kim, Professor YooTae-Keun from Korea were also guests in Höhr-Grenzhausen in June 2015. 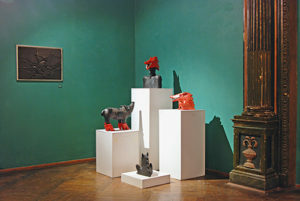 At the Keramikmuseum Westerwald, they put on a joint exhibition under the motto, Silent Strength and Power Drink, Ceramics and Tea – the classic tea bowl and its creative variations. 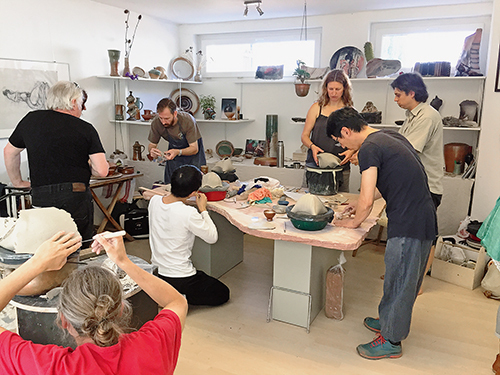 A further workshop was planned with Robert at the ceramics studio, Z-Keramik, and Jeon Changyun’s family spontaneously announced they would be coming. The young Korean ceramist Oh Haram joined in a little later. The artists were selected by Sofia Bunardzic, often on the basis of recommendations from other artists. They work with the Zlakusa clay and are taught traditional regional coiling methods on hand-operated wooden wheels identical to those traditionally used by potters in the village. 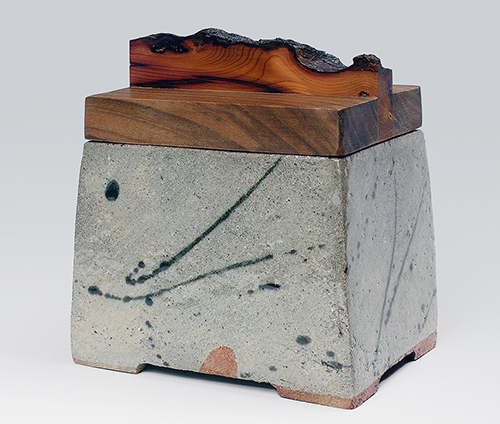 Then, dry unglazed works are finished in a 60-minute open-air firing at approximate 600-700 degrees Celsius. Without engobes, the clay fires black, red and brown. Tineke van Gils really needs no introduction. She is a masterly thrower and always knows how to find new inspiration when she is looking for the limits of technique and by changing the environment or the material. Who can explain looking for and finding inspiration better than Tineke herself? It is hard to be a creator. that has already been made a thousand times.